Willington Coffee Set: This contemporary Willington Coffee Set brings character to your outdoor space. 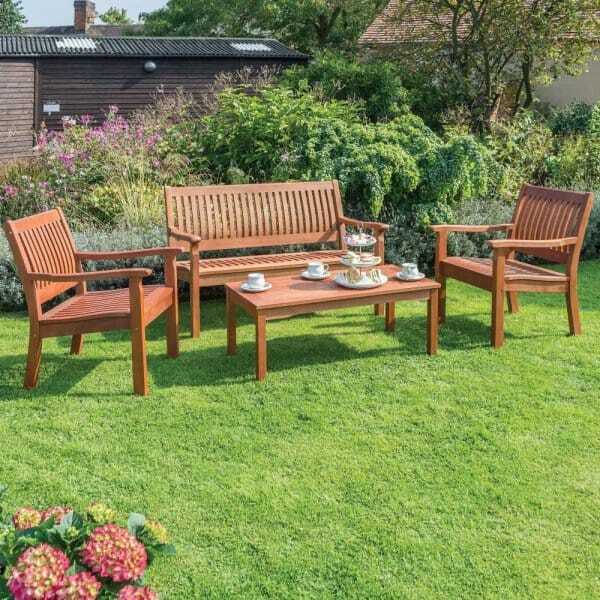 The Coffee Set consists of a 3ft bench with 2 chairs, allows plenty of room to accommodate family or guests comfortably. The table provides plenty of space and is the perfect height to place your refreshments upon. The shaped seat and back rests ensures comfort which allows you to relax and enjoy the surroundings and present company. This sturdy collection has been constructed from FSC certified hardwood and is factory stained for an attractive finished design. Easy to assemble and can be used all year round.